There are thousands of expats in Thailand especially in the Greater Bangkok area. Some of them are working expats, some are retired some are tourists here on a 'long term holiday' and some....well exist in a murky world that can't be really classified as any of the former. The majority are western expatriates in Bangkok at least. American expats, British expats and Germans make up the majority of the expatriate community. Working mainly for foreign owned companies in Bangkok and living in the expat ghettos of Sukhumvit and silom. 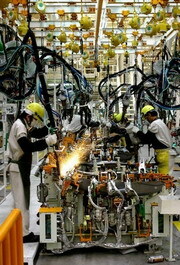 There is also a significant number of Japanese expats in Bangkok, the majority of whom are working legally and employed by Japanese companies in Thailand. Other Asian countries are well represented. Koreans, Chinese, Indonesians and a fairly large community of Philippine expats mainly working in teaching jobs and a few working in export departments where communicating with foreign customers is essential and the local Thai staff lacking in language skills. Bangkok Companies maintains a comprehensive contact database of expats in Bangkok and expats in Thailand. This database contains contact details of over 6,000 foreign expats generally known as "Farang"
There are thousands of websites out there dedicated to helping expats live and survive in a foreign land. There are hundreds of websites written or contributed to by by expats in Thailand. This section of Bangkok Companies site is not intended to be a "I have lived in Bangkok a long time so I know best" Rather I would like to share some avenues that I find useful and have found in the past to give good advice or good sources of info for those wanting to live in Bangkok or Thailand and especially for those foreigners or foreign companies in Thailand who want to do business in Thailand. In this section I want to try to help established foreigners and those planning to come to 'The Land of Smiles' with relevant information and guidance to expat websites, expat associations and businesses that are expatriate orientated. I have included another section Expatriates in Bangkok, Expatriates in Thailand. In this section I want to give an overview of life for expatriates staying in Thailand and explore the possibilities for doing business with and amongst this extensive foreign community. Thai Cascolour Thailand Foreign Expatriate business in Bangkok providing Computer Graphics and graphic design services.